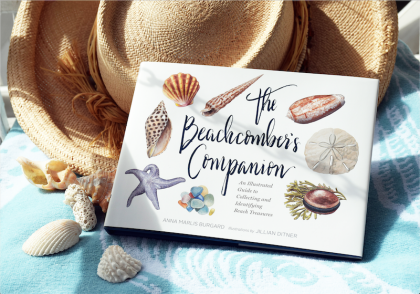 The Beachcomber's Companion: An Illustrated Guide to Collecting and Identifying Beach Treasures (Chronicle Books, 2018) by Anna Marlis Burgard with illustrations by Jillian Ditner is available locally at Books to Be Red. June 21 marks the beginning of summer, but it is also National Seashell Day! Many of us go to the beach and come home with beautiful shells without knowing very much about the shells we have collected and the creatures that formerly made those shells home. Anna’s book is the product of her desire to help preserve the habitats of the creatures that live in the shells many beachgoers pick up. “The main reason I wrote the book was because I encounter people who take live animals home from the beach, often because they don’t know they’re doing so; the book’s a stewardship tool in that regard, a way to pleasantly educate shell collectors,” she said. The Beachcomber’s Companion also contains a list called “The Beachcomber’s Commandments,” which details common courtesies and safety measures shell-hunters should keep in mind as they search the beach. These include being respectful of others—animals and people alike—and being aware of the power of the ocean and the many animals that can harm you. The Beachcomber’s Companion is available on Ocracoke at Books To Be Red. Anna has been visiting Ocracoke since 1991, and has been collecting shells her entire life. “My mother used to joke that my backside was always more tanned than my front because I was stooped over searching for treasures in the sand,” she said. She hopes that she can help beachgoers and shell enthusiasts to learn about the shells they find and collect them responsibly. 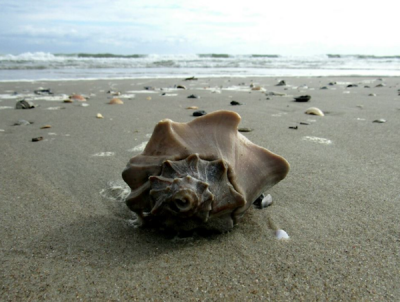 Many beautiful shells can be found on Ocracoke’s beaches. The most common shells are Scotch Bonnets, whelks and conchs, moonshells, olives, coquinas, and scallops, and while Anna calls the Scotch Bonnet “the prize,” she does point out that they are very delicate and are not often found intact. Bay scallops and calico scallops are quite common on Ocracoke. Scallop season is mostly in the winter, and when the gulls drop them on the road to break them open, the sharp broken pieces can cause many a flat tire on the island. However, scallop shells can be found at all times of year on the beach. 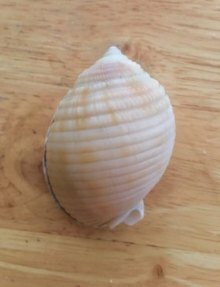 Some of the most prevalent whelks are the lightning whelk, the knobbed whelk, and the channeled whelk. There is one main difference between lightning and knobbed whelks: lightning whelks open left, and knobbed whelks open right. Lightning whelks may open on the left, but Ocracokers call them right-handed whelks because the right hand holds the shell to scoop up water to drink. Knobbed whelks, on the other hand, open on the right, however Ocracokers call them left-handed whelks because the left hand holds the shell to scoop up water. Julie spoke a lot about the different types of jewelry that can be made from shells. “For the first few years of Village Craftsmen, I made coquina earrings. Coquinas are right under the high tide line, and when the water recedes, they pop up out of the sand. Because they’re bivalves, I’d make earrings out of them,” she said. Now she makes calico scallop necklaces for my cousin Lachlan to sell at his shell shop for $2. It is very difficult to drill a shell because they shatter so easily, so people sometimes string together broken shells with holes already in them to make shell mobiles. Lachlan opens his shell shop in his yard and sells a variety of different shells that have been picked up off the beach, including scallops, scallop necklaces, conches, whelks, and sand dollars. Lachlan follows in the footsteps of many young Ocracokers who have set up on-and-off shell shops over the years, including my father and my aunt. Julie reminded me that shells aren’t the only treasures you can pick up from the beach. Conch egg cases, driftwood, shark teeth, sand dollars, and coal can also be fun finds on the beach! The best time to go shelling is around low tide because you can walk further out and see more shells. So this National Seashell Day, have fun searching for shells and have a wonderful first day of summer! Anna Marlis Burgard is an author, photographer and lifelong beachcomber. The founder of IslandsofAmerica.com, she has visited more than 100 of the 17,000 U.S. islands. Her work has been featured on Atlas Obscura, BBC Radio, NPR and Roadfood.com, and in Garden & Gun, The New Yorker, Spirituality & Practice, and USAToday. 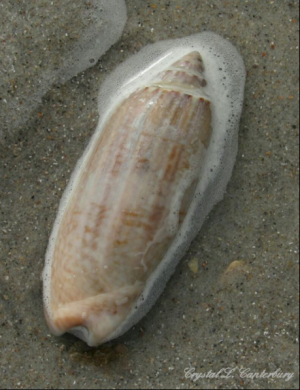 She lives on Tybee Island in Georgia, whose state shell is the knobbed whelk. Zoe Howard is the Current's newest contributor. She just graduated from Agnes Scott College with a degree in Creative Writing and History. She's spending the summer on Ocracoke and playing a pirate in her grandma's musical, "A Tale of Blackbeard," and working in her grandpa's shop, The Village Craftsmen.